AleaSoft provides energy forecasting products and services, improving the performance of our clients. As a modern and vanguard company, AleaSoft acknowledges the increasing importance of renewable energy forecasting and in that sense, offers solar energy –photovoltaic and thermal- forecasting. Over the years, AleaSoft developed a forecasting methodology that is unique, guaranteeing the highest degree of efficiency and accuracy. AleaSoft´s solar energy forecasting is a product in the family of AleaSoft´s renewable energy forecasting, is a reflection of our precision in predictions. Furthermore, AleaSoft acknowledges the importance of solar energy forecasting in order to provide better energy price forecasting. In that sense, AleaSoft complements price and demand forecasting with forecasts related to other price-related variables that are also of interest to market players, such as forecasts of commodity prices (oil, gas, coal, CO2 emissions), production by technology (wind, hydro and solar) and meteorological variables, also influencing the energy industry. 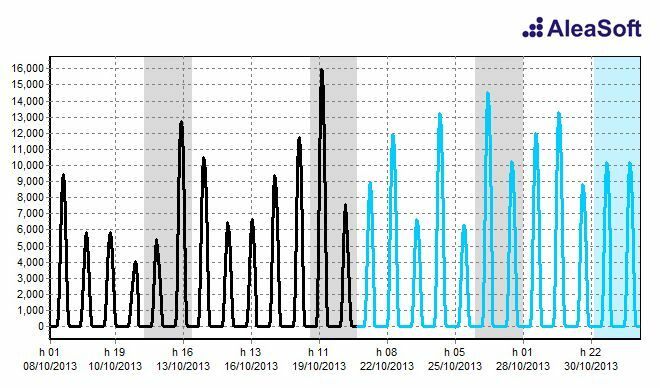 The AleaSolar solution offers short and mid term forecasts of solar energy production. AleaSolar allows you to obtain real time hourly forecasts, with different horizons: from 24 hours (a day) to 240 hours (10 days). Once the model has been selected, the application works automatically. The AleaSolar solution is installed and customised to reflect your needs. Forecasting can be done at a national level, regional level or for an individual solar park. The data of the AleaSolar solution can be aggregated or disaggregated, and all solutions are compatible with long series, of unlimited length. An adaptive scheme updates the model parameters on an ongoing basis, allowing a user with no statistical knowledge to operate the solution. The AleaSolar solution is updated with weather data, such as cloud cover. The data feeding and forecast can be automatically done at a certain hour. Automatisation: a custom-made installation allows an automatic operation. The system can be configured to automatically update data, generate forecasts and distribute the results, at a certain hour.